The location is very convenient but the bedroom is a bit small for two queen beds. Our room waa very clean. Elevator worked well. I could hear people walking above me and hear noise in the hallway. Where to find Bakersfield hotels near an airport? Where can I find hotels in Bakersfield that are near tourist attractions? Visitors are spoiled for choice when it comes to booking comfortable lodgings in Bakersfield. Spend some time perusing our 48 hotel options, all of which can be found within a 0.1-kilometre (0.06-mile) radius of Bakersfield's center. 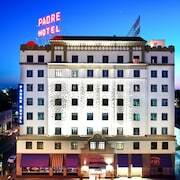 Those hoping to base themselves close to the center of Bakersfield, can check out the rates and amenities at the The Padre Hotel and Bakersfield Marriott at the Convention Center. Other areas with a range of hotels include Delano and Wasco. The Holiday Inn Express Delano and Best Western Liberty Inn are in Delano, while Wasco is where you'll find the Best Western Plus Wasco Inn & Suites and Cinderella Motel. The Days Inn Lost Hills and Motel 6 Lost Hills are located in Lost Hills, while Super 8 Buttonwillow and Rodeway Inn I-5 at Rt. 58 are part of the Buttonwillow area. The Holiday Inn Express and Suites Bakersfield Central and Hampton Inn Bakersfield-Central are close to the Kern County Museum. The Holiday Inn Express and Suites Bakersfield Central is 2 kilometres (1 mile) away from the Kern County Museum. The Hampton Inn Bakersfield-Central is 3 kilometres (2 miles) away. Budget-concious travelers rejoice! The Bakersfield area provides a nice range of low-cost hotel options. 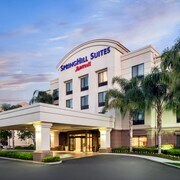 2 kilometres (1 mile) from Bakersfield's downtown is the La Quinta Inn Bakersfield South. The Bakersfield Inn & Suites is just 7 kilometres (4 miles) away. The Super 8 Bakersfield Central and the Econo Lodge Gorman are some alternative affordable options that you could consider. 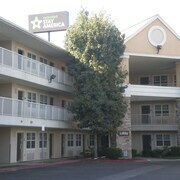 You could also check out the Homewood Suites by Hilton Bakersfield as well as the Residence Inn by Marriott Bakersfield. 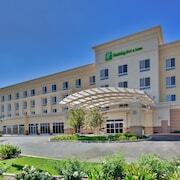 The Homewood Suites by Hilton Bakersfield is situated 8 kilometres (5 miles) from the center of Bakersfield. 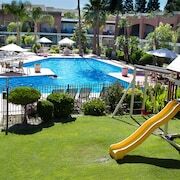 The Residence Inn by Marriott Bakersfield, is located 3 kilometres (2 miles) away. Another option is to investigate the Holiday Inn Hotel & Suites Bakersfield or the SpringHill Suites by Marriott Bakersfield. The larger Central California area is certainly worth seeing as well. Spend time at Central California's lighthouses and also admire its valleys. Popular activities in this particular part of United States of America include snowboarding, skiing and mountain biking. Mojave is 85 kilometres (53 miles) to the southeast of Bakersfield and is home to the Mojave Chamber of Commerce and Camelot Golf Club. 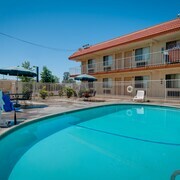 The Mariah Country Inn & Suites and Motel 6 Mojave - Airport are some of the Expedia-recommended hotel options in Mojave. 85 kilometres (52 miles) to the southeast of Bakersfield, you'll find Mojave, which is home to the Americas Best Value Inn and Red Roof Inn Mojave. The Mojave East Park and Marl Springs are a couple of the most popular places to see while in Mojave. Situated 6 kilometres (4 miles) from Bakersfield is Meadows Field Airport. Stay nearby at Hampton Inn Suites Bakersfield NorthAirport or La Quinta Inn & Suites Bakersfield North. What are the most popular Bakersfield hotels? Are there hotels in other cities near Bakersfield? What other types of accommodations are available in Bakersfield? Explore Bakersfield with Expedia.ca’s Travel Guides to find the best flights, cars, holiday packages and more!